The FiveThirtyEight presidential forecast for Monday was essentially unchanged, with President Obama having a 74.8 percent chance of winning another term. Taken on the whole, Monday’s data was consistent with the current “story” the forecast model is telling about the race, which is that Mr. Obama’s polls have declined slightly from their post-convention highs, but are also still slightly better than his preconvention polls. If you look hard enough, of course, you can find polls where Mr. Obama’s convention bounce has evaporated completely — or others in which it hasn’t declined at all. But the forecast model, whatever its strengths or weaknesses, is pretty good at determining what the consensus of the data says at any given time. So at this moment of relative calm in the overall forecast, let’s take a moment to peek at the Electoral College. I’ll have an overview of the status of individual swing states in The New York Times Magazine this week, so our focus here will be a little more “macro,” on the relationship between the Electoral College and the national popular vote. As of Monday, the forecast gave Mr. Obama a 76.1 percent chance of winning the popular vote, but a 74.8 percent chance of winning the Electoral College. In other words, as of right now, Mr. Obama is more likely to lose the Electoral College while winning the popular vote than the other way around. The difference isn’t large, but it generally goes against the conventional wisdom that Mr. Obama’s position is superior in the Electoral College than in the popular vote. For that matter, it also goes against what our model had found at some earlier points in the race, when Mr. Obama’s position in the polls seemed to be more robust in swing states than in the country as a whole, and it therefore perceived a slight advantage for him in the Electoral College. But in general since the conventions, Mr. Obama’s bounce has been a bit more apparent in polls of noncompetitive states — or states that are on the fringe of being competitive — than in the true “tipping point states” that are most likely to determine the election. Mr. Obama’s polls in the tipping point states aren’t bad by any means — he’s led in the vast majority of them. But they haven’t conveyed any particular strength there. For every set of very strong swing-state numbers, like the trio of NBC News/Marist polls that Mr. Obama got in Virginia, Florida and Ohio last week, there seems to be a mediocre data point for him. On Monday, for instance, Public Policy Polling released a survey showing Mr. Obama just one point ahead in Wisconsin, a state we had been curious about. That represents a technical improvement for Mr. Obama over Public Policy Polling’s last survey of Wisconsin, which had Mitt Romney up by one point. But since Public Policy Polling generally shows pretty good numbers for Mr. Obama — and this particular poll was commissioned for a liberal group, Democracy for America — it’s hard to view it as all that much of a positive for him. Mr. Obama’s polling has been somewhat more favorable in Ohio. Really, whenever we’re talking about the relationship between the Electoral College and the popular vote, a lot of what we’re talking about is just Ohio, since it has better than a one-in-three chance of being the tipping-point state. Even so, Mr. Obama’s current projected margin of victory in Ohio is 3.1 percentage points — slightly less than the lead the model gives him in the national popular vote, which was 3.3 percentage points as of Monday’s forecast. In other words, Mr. Obama is not especially likely to win Ohio despite losing the popular vote nationwide; it could happen, but the reverse scenario is at least equally likely. Of course, Ohio is normally just slightly Republican-leaning relative to the country as a whole, so the fact that it’s polling almost exactly at the national average is a positive for Mr. Obama. But there are other states in which Mr. Obama seems to be underperforming slightly. In 2008, for instance, Mr. Obama won Colorado by a wider margin than he did Ohio. This year, however, his projected margin of victory in Colorado is 2.3 percentage points, slightly less than in Ohio — and also slightly less than his margin in the national popular vote. Similarly, Mr. Obama’s projected margin of victory in Virginia right now is 1.3 percentage points. If you total up the electoral votes from the states where Mr. Obama is currently running better than he is in Ohio, as according to our forecasts, they equal 263 electoral votes — not quite enough for him to win. To the extent that Mr. Obama has an advantage, it’s that he has a lot of options for how to get those remaining electoral votes, including any one of Virginia, Colorado, Ohio and Florida (although the 263 total includes a couple of states, like Wisconsin and Iowa, where Mr. Obama’s position is not particularly safe). Still, it would be possible to overrate the importance of this. In the chart below, I’ve listed the probability of each candidate winning the Electoral College conditional upon achieving a particular result in the popular vote, as based on the 25,001 simulations that the model ran on Monday. 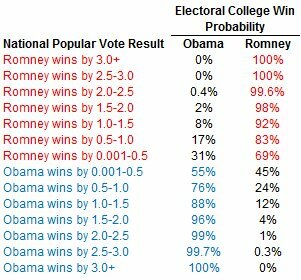 For instance, if Mr. Obama won the popular vote by between 0.001 and 0.5 percentage points over Mr. Romney, the simulations find that he’d have a 55 percent chance of winning the Electoral College also. If he won the popular vote by between half a percentage point and one point, he’d win the Electoral College about three-quarters of the time. Mr. Romney’s numbers are ever-so-slightly stronger in each category. He’d have a 69 percent chance, not 55 percent, of winning the Electoral College if he won the popular vote by less than half a point. And he’d have an 83 percent chance of winning the Electoral College conditional upon winning the popular vote by between half and one percentage point. rcent of the time that he won it by between one and a half and two percentage points. And in none of the 25,001 simulations did a candidate win the popular vote by more than three percentage points and lose the Electoral College. If there were the possibility of a distortion that large, we’d have seen it in the swing state polls by now — but instead, they’ve tracked pretty close to the national averages. And really, that’s about how it should be. Many of the swing states — certainly Ohio, for example — resemble the country in microcosm. Perhaps you can run just slightly better or weaker in one of them because of local economic conditions, or some quirky regional issue — and to the extent that stuff matters, we’ll try to sort it out. But in general, if you’re winning over the sorts of voters who you’ll need to win to take Ohio, you’ll probably be connecting with a winning coalition of voters in most of the other swing states. On an unrelated note, we’re starting to see more cases in which multiple versions of the same poll are published — for instance, the figures among both likely voters and registered voters, or as listed with and without “leaners” (voters who initially say they’re undecided but pick a candidate after an additional prompt from the interviewer). Sometimes the polling firm will emphasize one or another of these numbers in its news release. (Rasmussen Reports, for instance, has begun to publish the results with leaners in its tracking poll, but has been highlighting the “without leaners” version in its write-ups.) But we don’t look at the news release — we look at the fine print, and we need consistent procedures to handle these cases. A poll of likely voters is always preferred to a poll of registered voters. A poll of registered voters, similarly, is always preferred to a poll of all adults. The model applies a likely-voter adjustment in cases where only registered-voter or adult numbers are listed. The “with leaners” version of the poll is always preferred to the version without it. A different case is when the pollster “allocates” the undecided voters based on some mathematical formula, rather than from their responses to the survey. I strongly dislike this practice — it’s the pollster’s job to convey the preferences of the voters who do commit to a candidate, and up to the rest of us to determine what the undecided voters might do. So we use the pre-allocation numbers, where available. Pollsters will sometimes also publish numbers using multiple turnout models, e.g. assuming a higher and lower turnout. We simply average all such numbers, rather than guessing at what the “official” version of the poll is. Some of these cases are debatable. I haven’t investigated, for example, whether polls do better with or without third-party candidates listed, and the answer may depend on the circumstances. But the point is that we do not want to make a lot of judgment calls on a poll-by-poll basis. So we apply these rules consistently.